NVS Assistant Commissioner(Administration), Assistant and Computer Operator Admit Card 2019 Released…!!! Good news for the candidates those who are eagerly waiting for NVS Teaching & Non Teaching Admit Card 2019. 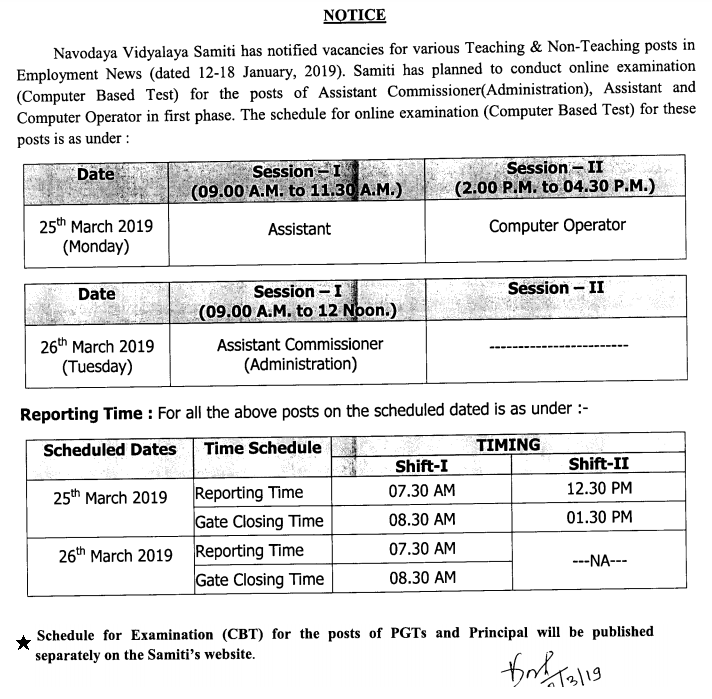 The higher officials of Navodaya Vidyalaya Samiti (NVS) are ready to conduct the NVS Teaching & Non Teaching (Principal (Group-A), Assistant Commissioner (Administration) (Group-A), Assistant (Group-C), Computer Operator (Group-C) examination on 25th, 26th March 2019. From this article, aspirants can get complete information about the NVS Teaching & Non Teaching Admit Card 2019. To fill the 251 Teaching, Non Teaching Posts candidates have to appear to the written test. At the time of going to appear for examination, aspirants have to remember that they have to carry their Navodaya Vidyalaya PGT Hall Ticket 2019 along with them. Else the NVS higher officials will not allow them to write the test. 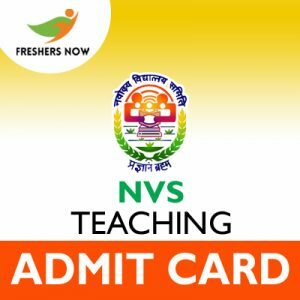 At last of this page, we had provided the direct link to download the NVS Teaching Admit Card 2019. And also it can be from the official site @ navodaya.gov.in. NOTE: Only the Assistant Commissioner(Administration), Assistant and Computer Operator Posts is Released. And the Schedule for Examination (CBT) for the posts of PGTs separately on the Samiti’s website. At the time of appearing to the examination, candidates are advised to carry their Navodaya Vidyalaya PGT Hall Ticket 2019 with them without fail. And in addition to that aspirants have to carry any one of the following documents for the security reasons. Before appearing to the written test candidates have to cross-check the details present in the Navodaya Vidyalaya Samiti Teacher Hall Ticket 2019 about them are correct or not. If the details present on it are not correct bring it to the notice of higher authorities of Navodaya Vidyalaya Samiti (NVS). They will rectify the problem and resend you the correctly formatted Navodaya Vidyalaya Samiti Teacher Hall Ticket 2019. Candidates, those who are waiting for downloading the Navodaya Vidyalaya PGT Hall Ticket 2019 can refer to this section. In this section, our team had provided step by step procedure to download the Navodaya Vidyalaya PGT Hall Ticket 2019. Aspirants can follow these steps for easy download. Firstly, applied candidates are requested to visit the official site of Navodaya Vidyalaya Samiti (NVS). Here the official website of Navodaya Vidyalaya Samiti is navodaya.gov.in. Then you will get the home page of NVS on the main screen. Now scroll down the home page, there you will get the What’s New section on the right side. In that section, search for the Navodaya Vidyalaya PGT Hall Ticket 2019 link. Recheck the details you provided like registration number and password are correct or not. Now you will get the Navodaya Vidyalaya PGT Hall Ticket 2019 on the new page. Download the navodaya.gov.in Admit Card 2019 in the prescribed format to your PC. Take two to three copies of the Admit Card and carry them along with you till the end of the examination. For more updates regarding the Navodaya Vidyalaya Hall Ticket 2019 keep visiting our webportal Freshers Now.